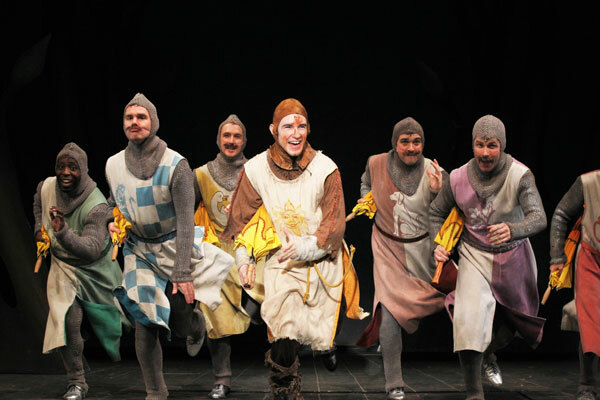 The knights of Drury Lane’s “Spamalot” take a dance break. In Spamalot, the 2005 Tony-winning musical “lovingly ripped off” from the 1975 film Monty Python and the Holy Grail, you can’t help but take that advice, which is sung a number of times in the show, and smile all the way home. Drury Lane continues to produce some of the best musicals in the Chicago-land area, and you’d be a fool to miss this production. The show, which was conceived and written by Python’s Eric Idle (with music by John Du Prez), is complete nonsense, loosely based on the legend of King Arthur and his knights of the roundtable as they embark on their quest to find the Holy Grail. Non-sequiturs, anachronisms and fart jokes abound, and the plot often takes a back seat for another zany production number. In one of the funniest moments, a surly French knight calls out for all the “French people” to look at a giant wooden rabbit that Arthur’s men planted as a (failed) decoy, and out walk: a painter, a women with wine in one hand and a baguette in another, a mime, and a sad little girl with long, brown hair wrapped in a dusty trench coat and holding a giant flag of France. If you get that last reference, this show is for you. This is a show that must be as fun to be in as it is to watch. Director William Osetek has brought together a cast filled with talent and experience. These are real pros, and know just how far to take a joke without killing it. You couldn’t ask for a better King Arthur than David Kortemeier — he’s regal, sincere, and has a slight twinkle in his eye. His court is made up of Sir Lancelot (John Sanders), Sir Galahad (Sean Allan Krill), Sir Robin (Adam Pelty) and Sir Bedevere (Bradley Mott) — each one is given a moment to shine. As the Lady of the Lake, Gina Milo is very good, if a somewhat slight presence in both sound and stature against the male-dominated cast. Her big act two number, “What Ever Happened to My Part,” was less spirited and soulful than others I’ve heard in the part, and more Celine Dion. A fine, if safe, choice. And I’d be remiss to not mention the music arrangement, since I’d recently interviewed Carey Deadman, who serves as Drury Lane’s music arranger. Despite only a fraction of players in the pit from the national tour I saw five years ago, the band sounded wonderful and full, expertly mining all the comedic musical cues in the eclectic, brassy score. With tickets under $40, Drury Lane is the best value for your money in town, by far. The only downside is getting there — they should consider a shuttle system for those who don’t have their own transportation.